Luis Valdez at SJSU in 2015 for a revival of his landmark play, “Zoot Suit” (photo by Neal Waters, ’07 Geography, ’15 MS Mass Communications). 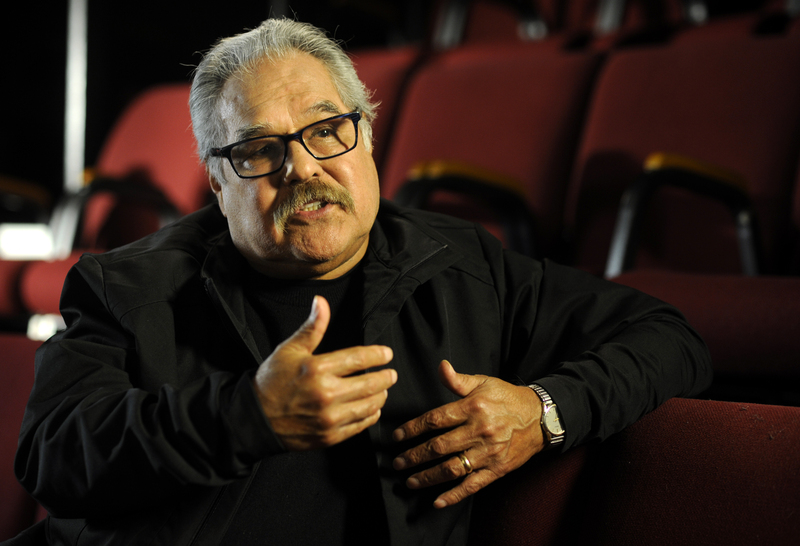 SAN JOSE, CA — San José State University will present its 2017 Tower Award to SJSU alumnus, activist, playwright and father of Chicano theater Luis Valdez at Inspiration to Innovation, a gala event to be held May 4, 2017, at the SJSU Event Center. Ticket information is available on the university website. The Tower Award, San José State’s highest honor, recognizes service to the university, community and society. Among the more than 40 recipients since 1972 are Susan Hammer; Norm Mineta; Peter Ueberroth, ’59 Business Administration, ’86 Honorary Doctorate; and Bill Walsh, ‘55 BA, ‘59 MA, Education. Awarded the National Medal of Arts by President Barack Obama in 2015, Valdez is perhaps best known as the force behind “La Bamba,” the 1987 film chronicling the life of rock-and-roll star Ritchie Valens. The popular movie is just one project from more than a half century of productions drawn from personal experience. Valdez was born in 1940 in Delano to migrant farmworkers. After graduating from James Lick High School in East San José, he went on to produce his first full-length play and earn a bachelor’s in English at San José State in 1964. The Shrunken Head of Pancho Villa shows the absurdity of Mexican American stereotypes and it is an excellent example of the timelessness of Valdez’s work. Soon after graduating from SJSU, the young playwright went on to lend his talents to a cause he knew well. During the Delano grape strike, he collaborated with civil rights leader Cesar Chavez to produce short skits highlighting the plight of the farmworker. El Teatro Campesino (The Farmworker Theater) in San Juan Bautista would become Valdez’s lifelong professional home and the inspiration for another timeless masterpiece, Zoot Suit. Commissioned by the Mark Taper Forum, the musical explores the complexities of a real murder trial compromised by racism. In 1979, Valdez took “Zoot Suit” to Broadway, a first in the history of Chicano directors. He earned Golden Globe nominations for the “Zoot Suit” and “La Bamba” films, both of which he directed. He received an honorary doctorate at SJSU in 1988 and returned in 2015 to stage a revival of “Zoot Suit” with his son Kinan Valdez as director. Valdez remains active in the theater community. 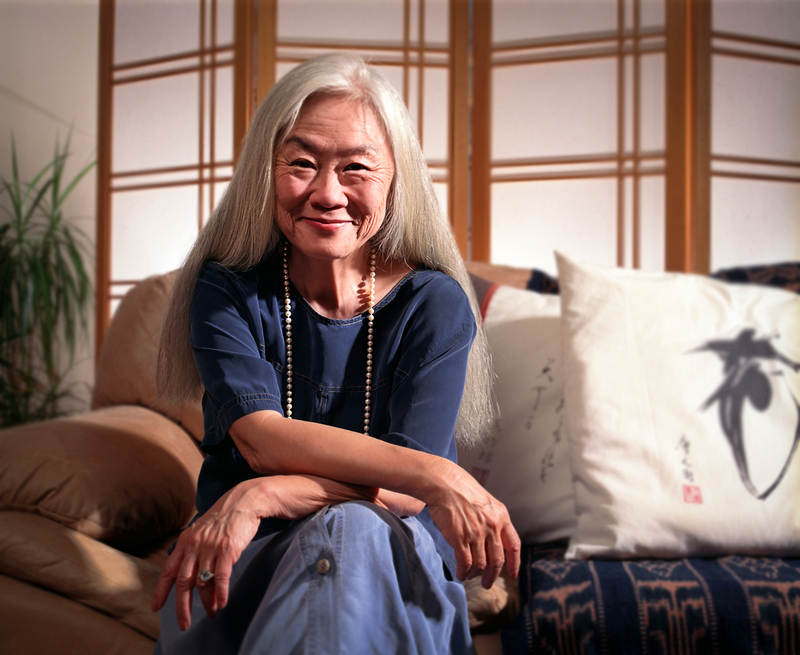 SAN JOSE, CA – Iconic author Maxine Hong Kingston will be the keynote reader at San José State University’s 2017 Legacy of Poetry Day Festival to be held from 5-9 p.m. May 3 at the Hammer Theatre Center in downtown San Jose. Kingston will be presented during the main stage reading at 7 p.m. All Legacy of Poetry Day festival events are free and open to the public. “The event will feature an all-star cast of Bay Area-based Asian American poets. This will extend SJSU’s celebration of National Poetry Month into May, and also kick-off Asian Pacific Heritage Month,” said Alan Soldofsky, professor of English and Comparative Literature and director of SJSU’s creative writing program. The 7 p.m. main stage program will include poets, spoken-word artists and musicians including: Santa Clara County Poet Laureate Arlene Biala; California Poet Laureate emeritus Al Young; award-winning San Francisco poet Barbara Jane Reyes; Metro columnist, SJSU Steinbeck Fellow and poet Gary Singh; poet/performer Genny Lim, accompanied by pianist Jon Jang, percussionist Jimmy Biala and saxophonist Francis Wong of the Pan-Asian Arkestra; San Jose spoken-word artists and poets ASHA, Lorenz Dumuk and Quyhn Nguyen. And musicians P.J. and Roy Hirabayashi, founders of San Jose Taiko. The event will begin at 5 p.m. in the Hammer Theatre Center lobby with readings by SJSU President Mary Papazian and Senior Vice President and Provost Andy Feinstein. They will be joined by other SJSU officials, alumni, students, faculty members and staff poets. President Papazian’s appearance will be one of several public programs she will take part in during her official inaugural week beginning May 1. The SJSU readings will feature works from SJSU’s long legacy of poetry, going back to Edwin Markham (1852-1940), and including other acclaimed SJSU alumni and faculty poets spanning 150 years. SJSU’s 2017 Legacy of Poetry Day Festival is sponsored by: Associated Students of SJSU, Poets and Writers Coalition, College of Humanities and the Arts, Department of English and Comparative Literature, the MOSAIC Cross Cultural Center, and the SJSU Office of the President. The festival is produced in association with co-sponsors CATS (Contemporary Asian Theater Scene), the 2016-17 Santa Clara County Poet Laureate, Poetry Center San Jose and Poets & Writers, Inc.
SAN JOSE, CA – Educator, author, and advocate for social justice Francisco Jiménez will receive the John Steinbeck Award at 7:30 p.m. (doors open at 7 p.m.) on Wednesday, September 28, in the Student Union Theater at San Jose State University. A highlight of the university’s celebration of Hispanic Heritage Month, the event will feature a conversation between Jiménez and Chicano political cartoonist Lalo Alcaraz. Proceeds from the event benefit SJSU’s Cesar E. Chavez Community Action Center. Camino Arts, a non-profit arts initiative, is a pro bono co-producer of this event. Tickets ($20 general, $10 student) are available at the Event Center Box Office (408-924-6333) or at ticketmaster.com. His critically-acclaimed books for young readers, including The Circuit: Stories from the Life of a Migrant Child, have given voice to families like his and introduced a generation of American children to the plight of migrant laborers in our country. SAN JOSE, CA – San Jose State University has received a $4.8 million bequest from the estate of Professor Emeritus of English and Comparative Literature Martha Heasley Cox. The gift will support the Center for Steinbeck Studies that bears her name. Cox’s total lifetime giving to SJSU is $5.5 million, the largest total ever for a faculty member. Shortly after arriving, Cox began collecting Steinbeck materials. The collection grew to become so extensive and well respected that it was incorporated into plans for the Dr. Martin Luther King Jr. Library, opened in 2003. The Martha Heasley Cox Center for Steinbeck Studies is the only university research archive in the world dedicated solely to Steinbeck’s life and work. 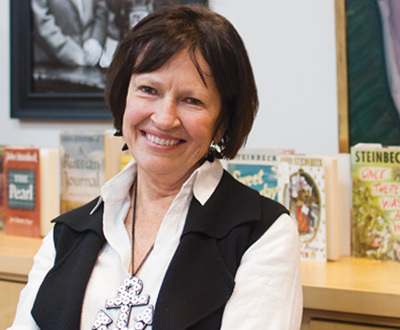 Cox was active in Steinbeck Center affairs throughout her 34-year SJSU teaching career and after her retirement. She died in September 2015 at the age of 96. 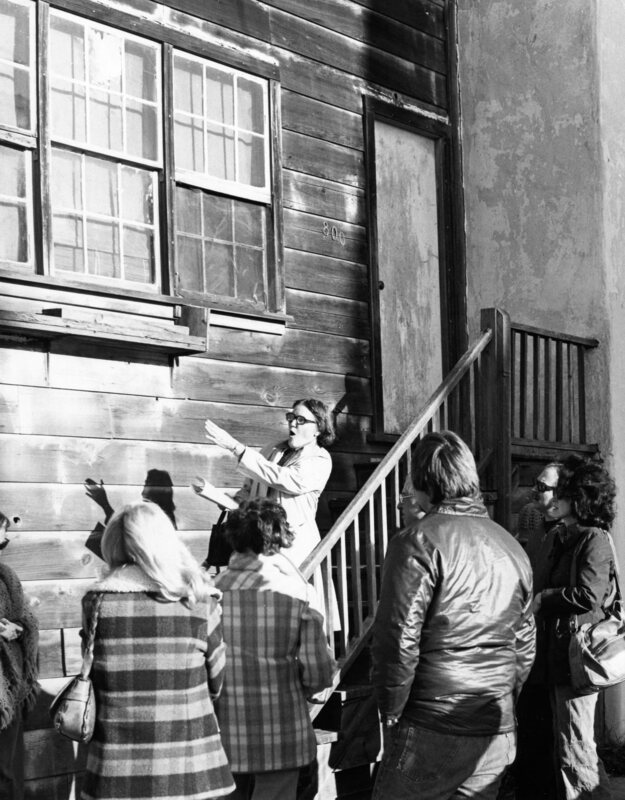 Leading a tour of Cannery Row (photo courtesy of Greta Manville). Professor Cox provided financial support for the collection from the very start, and she continued to do so as the center grew into a multi-faceted organization with many related programs. Her bequest means the center and its work will reach more students than ever before in an array of fields, from humanities and the arts to science and mass communications. For example, the Martha Heasley Cox Steinbeck Fellowships will receive $3.1 million from the bequest. Receiving the Tower Award (photo courtesy of the Steinbeck Center). The bequest will fund two more programs she founded. The Martha Heasley Cox Lecture Series will receive $1 million and the Cox-Manville Steinbeck Bibliography of everything Steinbeck will receive $690,000. Those who knew Professor Cox described her as an entrepreneur of arts and letters, offering a ceaseless stream of ideas on how to grow the Steinbeck collection and use its resources to encourage others to follow in the author’s footsteps. 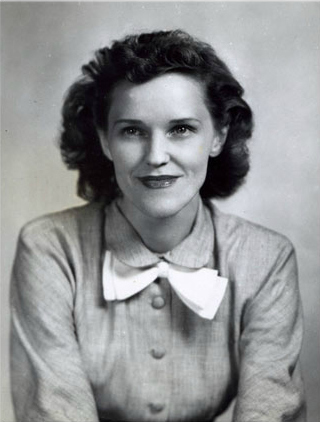 Martha Heasley was born in Calico Rock, Arkansas, in February 1919. She graduated with a bachelor’s in English from Lyon College, Arkansas, and received her doctoral degree from the University of Arkansas. In 1955, she moved across the country and joined the faculty at SJSU, where she taught for 34 years. She and her husband Cecil Cox divorced but remained lifelong friends. 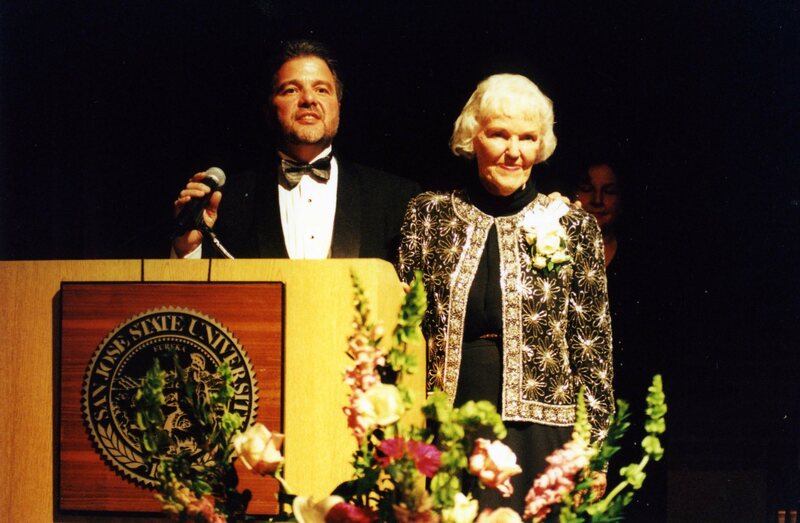 In 2000, she received the Tower Award, SJSU’s highest recognition for service to the university. “Martha’s case for John Steinbeck was difficult to resist. Her colleagues in the Department of English weren’t exempt from service to the cause,” said Professor Emeritus Arlene Okerlund, who was new at SJSU when she met Cox. The two worked together on pioneering Steinbeck conferences and remained friends in retirement. 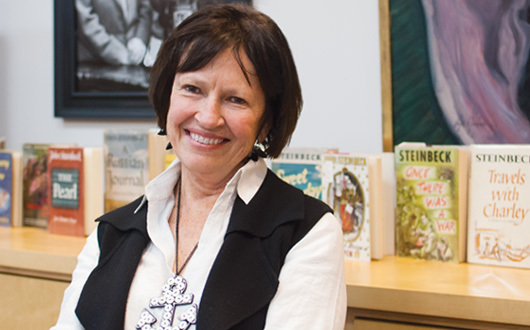 Cox recruited graduate student Greta Manville, ’75 BA ’78 MA English, to create the Steinbeck bibliography that came to bear both of their names. 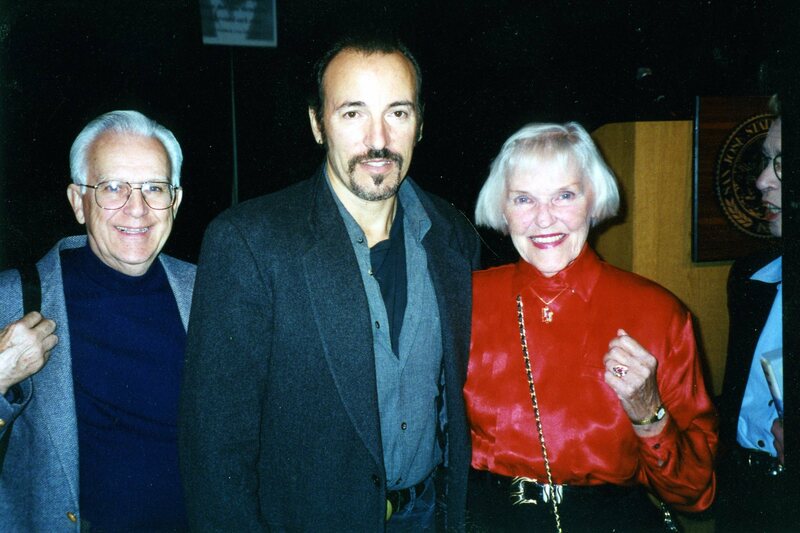 With Steinbeck Award recipient Bruce Springsteen (courtesy of the Steinbeck Center). In 1996, musician Bruce Springsteen reached out to the Steinbeck family with a request: he wanted to name his upcoming album and tour after the “Grapes of Wrath” protagonist Tom Joad. “Professor Cox’s warm relations with Steinbeck’s widow and literary agency led to an inspired idea,” Douglass recalled, the formation of the John Steinbeck Award: “In the Souls of the People.” The award became another way to honor Steinbeck’s legacy while supporting those who were following in his footsteps. Now a regular fundraiser for the Steinbeck Center, the award brings to campus writers, artists, thinkers, and activists whose work captures Steinbeck’s empathy, commitment to democratic values, and belief in the dignity of people who by circumstance are pushed to the fringes. 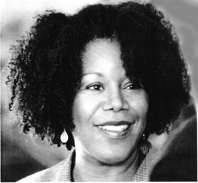 Recent recipients include civil rights icon Ruby Bridges, novelist Khaled Hosseini and documentary filmmaker Ken Burns.